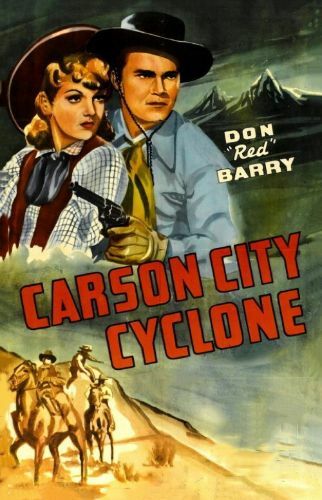 Carson City Cyclone stars Don "Red" Barry as a frontier lawyer with the deceptively mild-mannered monicker of Gilbert Phalen. After an argument with his judge/banker father (Noah Beery), Gilbert finds himself the Number One suspect when his dad is murdered. Endeavoring to prove his innocence and bring the guilty party to justice, Gilbert is forced to assume the guise of a fearsome outlaw. An awful lot happens in the course of the film's 57 minutes, and most of it happens to the hero. Featured in the cast are such reliable Republic-western heavies as Roy Barcroft and Bud Osborne.